On Editing opens a volume on ‘Textualities’ (PR, Vol. 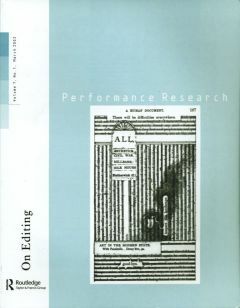 7, Nos 1–4, 2002) which considers the changing nature of performance texts and relations between writing, textuality and performance, in four related issues: On Editing, Translations, On Fluxus, and On Archives and Archiving. This issue will address the relationship between performance and publication, as well as the ways in which the traditionally invisible role of editor has changed. 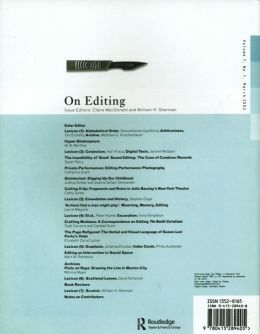 Contributions might look at the part played by editors in bringing performance to print, and at how editing might be related to other mediating and shaping roles – such as curating or dramaturgy. The place of editing in the work of artists themselves; the changing nature of the printed book; the future of editing in the new technologies; particular instances or case studies of editing; and the relation of the textual, aural and visual, might all be subjects for consideration. The editors also invite collaborations between artists and critics, as well as work that extends the possibilities of the visual page, or that situates critical work within a visual context.